Ever miss being a kid who could camp out with neighborhood friends for an entire carefree weekend? Embrace the nostalgia and avoid adulting for a bit by reliving your childhood with a group of friends on a “kidult” camping trip. Or, if you have little kids not yet ready for roughing it in the woods, bring the campfire activities into your backyard. 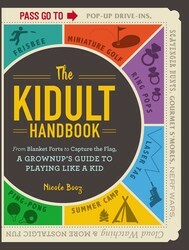 Nicole Booz, author of THE KIDULT HANDBOOK, shares 4 activities that are perfect for camping out! These simple treats will take you back to a much simpler time—when all you had to worry about was going to bed after dinner and not doing the dishes! Preheat oven to 375F. Line a baking sheet with aluminum foil. Lay out the crescent rolls on the prepared baking sheet. Place a piece of cheese and a hot dog on top of each. Roll up each crescent roll, wrapping the dough around the cheese and hot dog. Space out the rolls evenly on the baking sheet. Bake 12–15 minutes until cooked through. Red, yellow, blue—which colors will you choose? Tie-dyeing is an awesome craft that brings out the creative kid in us all. There’s a certain finesse to creating stunning patterns and turning a blank canvas into a uniquely colorful garment. But honestly, even if you don’t create a perfect spiral, you’ll still be proud to wear your me-made shirt. Pick up a tie-dye kit from a local craft store, get some plain white T-shirts, and let your creative flag fly! There’s no limit to the way you mix and match colors. Plus, this activity is great for all ages. Bring enough shirts and dye for everyone at your next family reunion or summer get together. That way everyone can take home their own colorful and unique souvenir to remember the day by. Are you really friends if you haven’t made a friendship bracelet together? Of course you are! But there is something really special about wearing a sign of friendship in a pattern you designed together. Wouldn’t it be heartwarming to look down at your wrist when you’re having a bad day and see a handmade reminder of your loyal bestie? To make a braided friendship bracelet, you’ll need three strands of brightly colored string, such as embroidery floss, about 6–9″ long (depending on your wrist size). Line up the three pieces of string. Tie one end of the strings in a knot, about 1⁄2″ from the end. Begin braiding from the knot toward the other end of the strings. Once you’re at the end, lay your wrist across the string. Have your friend knot the two ends of the bracelet around your wrist where it will stay until it falls off or you cut it off. Friends—and friendship bracelets—forever! If you thought writing letters by hand was a thing of the past, think again! (And no, my grandmother didn’t make me say that.) Nothing says you care like writing a letter to a sweet friend or relative just to let her know you’re thinking of her. Get a group of friends together and gather some art supplies (construction paper or card stock, scissors, glue, colorful pens, and cutouts) to make a ton of cards to send throughout the year. And make sure to bring snacks—crafting is hard work. Together you can design a plethora of holiday and birthday cards to send to each other or other friends and family. In the days before technology, we had to sit down and handwrite one another letters. It takes time and effort to really do that! A handwritten note in a handmade card is something to be treasured. Don’t forget the stamps—there are lots of fun ones to choose from! Looking for more family-friendly activities? We’ve rounded up 34 creative children’s activities to suit any age. Excerpted from The Kidult Handbook by Nicole Booz. Copyright © 2018 by Simon & Schuster. Used by permission of the publisher. All rights reserved. Adulting is hard! But “kidulting”— engaging in nostalgic childhood activities to relieve stress, like playing with your old favorite toys, participating in games and activities from your youth, and even snacking on the foods you enjoyed as a kid— isn’t. Let this book be your guide to indulging your inner child.“Kidulting” is a thing, and it’s growing! Especially popular among millennials, the term “kidulting” refers to engaging in activities from your childhood, sometimes with a grown-up twist. Psychology Today points out that playing like a kid helps you look at the world with fresh eyes—or “beginner’s mind”—which allows you to slow down and focus. The Kidult Handbook is a fun and informative guide to healthy escapism through play. Much like adult coloring books, kidulting is a way of focusing your mind on something fun and creative to relieve stress. But this book goes way beyond just coloring—it includes 160 ideas for fun, from timeless classics like building blanket and pillow forts, to generation-specific ideas, from millennials to boomers. Interspersed throughout are fun facts and trivia about games through the ages. 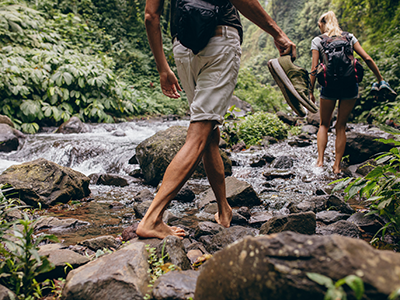 Most activities are unplugged and screen-free, and range from solitary pursuits to ones you can share with a friend or two. Feeling young again has never been so easy!